For decades, scientists have used techniques such as X-ray crystallography and nuclear magnetic resonance (NMR) imaging to gain invaluable insight into the atomic structure of molecules. Such efforts have long been hampered by the fact that they demand large quantities of a specific molecule, often in ordered and crystalized form, to be effective—making it all but impossible to peer into the structure of most molecules. "What we've demonstrated in this new paper is the ability to get very high spatial resolution, and a fully operational MRI technology," Yacoby said. "This work is directed toward obtaining detailed information on molecular structure. If we can image a single molecule and identify that there is a hydrogen atom here and a carbon there … we can obtain information about the structure of many molecules that cannot be imaged by any other technique today." "What we've done, essentially, is to take a conventional MRI and miniaturize it," Yacoby said. "Functionally, it operates in the same way, but in doing that, we've had to change some of the components, and that has enabled us to achieve far greater resolution than conventional systems." Yacoby said that while conventional systems can achieve resolutions of less than a millimeter, they are effectively limited by the magnetic field gradient they can produce. Since those gradients fade dramatically within just feet, conventional systems built around massive magnets are designed to create a field large enough to image an object—like a human—that may be a meter or more in length. The nanoscale system devised by Yacoby and colleagues, by comparison, uses a magnet that's just 20 nanometers in diameter—about 300 times smaller than a red blood cell—but is able to generate a magnetic field gradient 100,000 times larger than even the most powerful conventional systems. 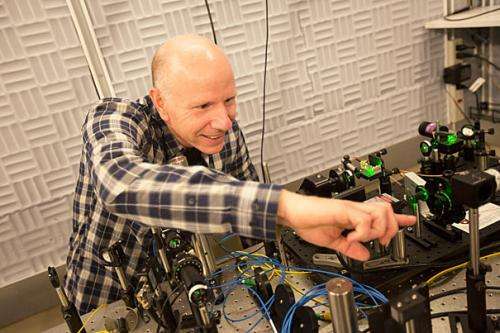 "By doing that, we can achieve spatial resolution that's far better than one nanometer," he said. The departures from conventional MRI systems, however, didn't end there. To construct a sensor that could read how molecules react to that magnetic field gradient, Yacoby and colleagues turned to a field that would appear to be unconnected to imaging—quantum computing. Using ultra-pure, lab-grown diamonds, the team milled tiny devices, each of which ended in a super-fine tip, and embedded an atomic-scale impurity, called a nitrogen-vacancy (NV) center in each tip, creating a single quantum bit, or qubit—the essential building block of all quantum computers. In experiments published last year, Yacoby and his collaborators showed that as the tip was scanned across the surface of a diamond crystal, the quantum bit interacted with electron spins near the crystal's surface. Those interactions could then be used to create an image of individual electron spins. However, while the sensitivity of the quantum bit sensor is sufficient to detect individual electron spins and represents a quantum leap forward from earlier efforts, its spatial resolution is limited by its distance from the object that is being imaged. "This is really a game of bringing both the magnet very close to generate large gradients, and bringing the detector very close to get larger signals," Yacoby said. "It's that combination that gives us both the spatial resolution and the detectability. "Our current system is already capable of imaging individual electron spins with sub-nm [subnanometer] resolution," he said. "The goal, eventually, is to put a molecule in proximity to our NV center to try to see the components within that molecule, namely the nuclear spins of the individual atoms composing it. This is by no means an easy task, since the nuclear spin generates a signal that is 1,000 times smaller than that of the electron spin … but that's where we're headed." If we had a way of creating a dense array of these probes that could be stepped across a surface, recording that surface at sub-molecular resolution, and if we had a way of peeling off one layer of atoms at a time, we could make sub-molecular destructive scans of our frozen cadavers and have sub-molecular resolution backup copies. Which could come in handy someday.